Fr. Evan Armatas welcomes Fr. 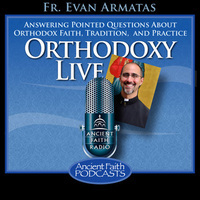 Alexander Rentel from St. Vladimir's Orthodox Theological Seminary as a guest co-host. Fr. Alexander is an expert on canon law and together they tackled a variety of listener questions from calls, email, the chat room, and pre-recorded.